China ordered more soldiers and helicopters into earthquake-devastated Sichuan province on Thursday to help reach tens of thousands of people trapped in rubble for more than three days. China is sending more soldiers and helicopters to earthquake-devastated Sichuan province on Thursday to assist in a desperate rescue mission to reach tens of thousands of people trapped in rubble for more than three days. Thousands of soldiers, many using their bare hands, have joined civilian rescue crews in digging for survivors through the remains of dozens of towns levelled by Monday's 7.9-magnitude quake. Troops were also sent to repair a cracked dam upstream from one of the worst-hit cities. 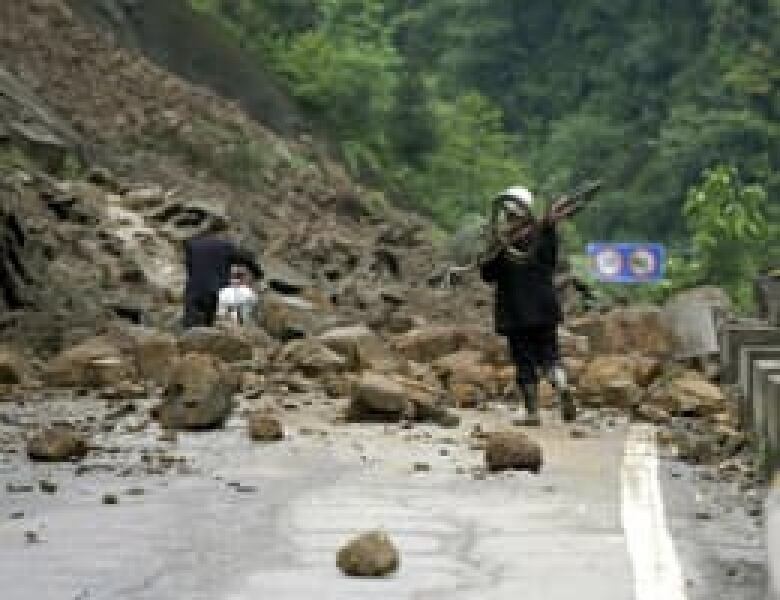 China's Defence Ministry said 71 more military helicopters and 30 civil choppers would be pressed into quake relief work, dropping emergency supplies for people in mountainous areas cut off by landslides and damaged roads, the official Xinhua News Agency reported. 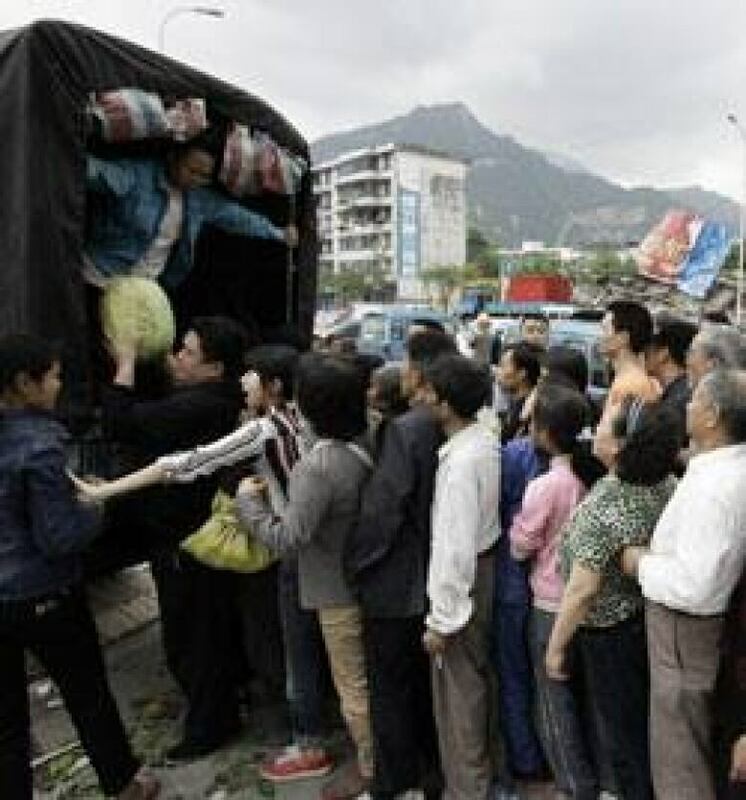 Chinese state media reported that the number of people dead is approaching 15,000, but that number is expected to rise sharply in the coming days. The latest figures from Chinese state media say nearly 26,000 are pinned beneath debris. 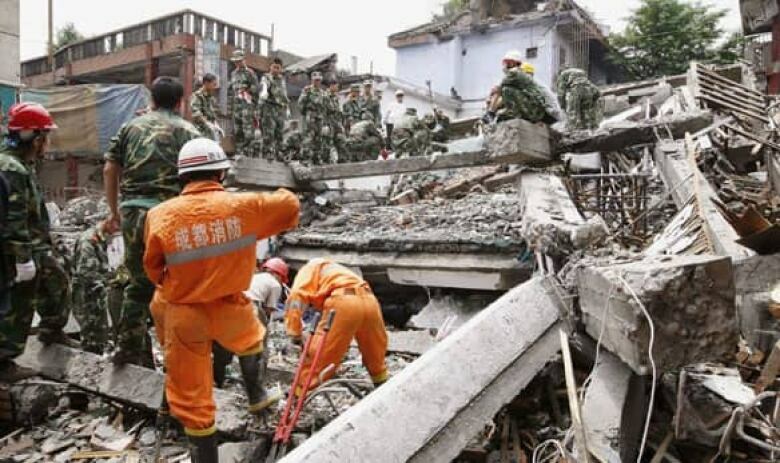 Xinhua news agency said 1,405 people were still missing in Sichuan. But officials warned that time is running out for people who are trapped without food or water and possibly with severe injuries. The scale of the devastation is raising questions about the quality of China's recent construction boom. In one dramatic rescue on Wednesday, workers pulled a eight-months-pregnant woman alive from the debris of an apartment building and whisked her away for medical treatment. The scale of devastation became clearer as more rescuers walked into the hardest-hit areas of Sichuan, finding towns where 80 per cent of the population had been killed in the quake. 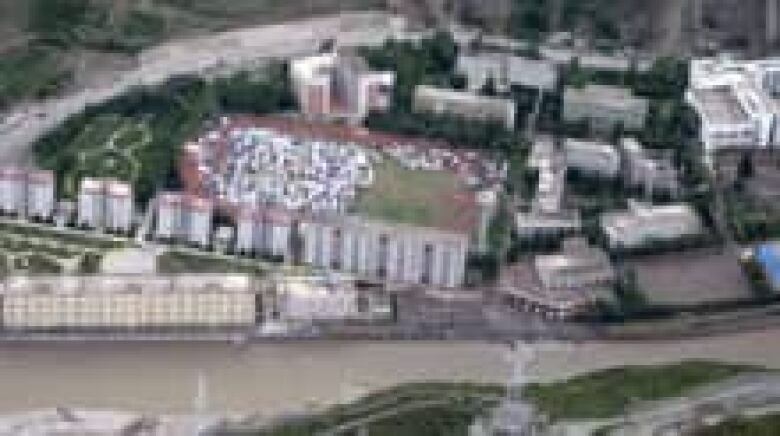 Xinhua reported 7,700 deaths in Yingxiu town, near the epicentre. 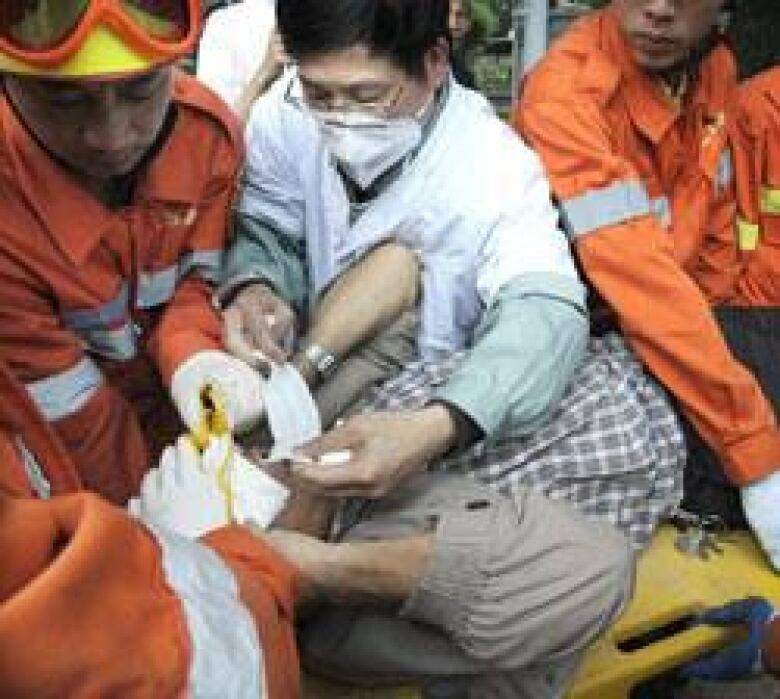 It's not clear if the official death toll reported by the agency includes the deaths in Yingxiu. Rescue workers who reached the town said it was "much worse than expected." The news agency also reported that 178 children who had been taking their noon nap were killed when their three-storey school collapsed in Qingchuan in northern Sichuan. China has already sent about 50,000 soldiers and an equal number of police into the affected areas to clear rubble and deliver aid and medical supplies. Troops were also sent to plug "extremely dangerous" cracks in the 156-metre Zipingpu dam upriver from the city of Dujiangyan, Xinhua said. The Sichuan provincial government said late Wednesday that inspections of the dam had found the structure to be safe, according to a statement broadcast on state TV. An adjoining hydroelectric station was still closed, authorities said. He Biao, the director of the Aba Disaster Relief headquarters in northern Sichuan province, said there were also concerns over dams closer to the epicentre. No damage has been reported to the Three Gorges dam, which is 350 kilometres from the epicentre in Sichuan province. CBC's Michel Cormier reported from near Chengdu that better weather conditions are making it easier for rescue crews. "The rain that has been relentless for the past two days has subsided," Cormier said, "which may give more time, more space for the rescuers to do their work." Cormier added that police and soldiers have traditionally been suspicious of foreign media in China, but this time they couldn't be more co-operative. "It's as if they realize that you're showing them doing good work for their country. It's unique in the history of covering disasters in this country," he said. A three-year-old girl who was trapped for more than 40 hours under the bodies of her parents in Beichuan region was pulled to safety, Xinhua said. Rescuers found Song Xinyi on Tuesday morning, but were unable to remove her because the piles of debris above were unstable. She was fed and shielded from the rain until rescuers could safely extricate her from the rubble. China's Premier Wen Jiabao comforted the girl and looked over her wounds, part of his highly publicized tour of the disaster area aimed at reassuring the public about the government's response and to show it is ready to host the Beijing Olympics in August. Wednesday's leg of the Olympic torch relay in the southeastern city of Ruijin began with a minute of silence. The devastation and rescue efforts across a large, heavily populated region of farms and factory towns have strained local governments. Food has dwindled on the shelves of the few stores that remain open. Gasoline is scarce, with long lines outside some stations and pumps marked "empty." Price gouging was evident at some stores. A package of instant noodles normally selling for 35 cents now costs $1.15. There have been some complaints that delays in aid had caused more deaths in the immediate aftermath of the quake. In the city of Hanwang, near Chengdu, a man who gave only his surname Li told the Associated Press that he had suffered a double tragedy. His wife was killed while watching TV and his daughter died when her school collapsed. The child did not die right away and could be heard saying, "Please help me daddy, please rescue me," right after the earthquake, he said, but there were no authorities to save her. In Dujiangyan, a mother pleaded with police at a roadblock for information about her husband, who was working in Wenchuan. "I've begged and begged them to help me look for my husband," Li Zhenhua said, showing her husband's ID card to a crowd of onlookers. "I can't go by myself because I've got a little baby and elderly parents here, so I can't leave." "The government is doing nothing for us. The government won't help us," she said, over and over. China has said it welcomes international aid and donations, but observers say the Beijing government is skilled at disaster management and mobilizing its own resources, so the country may not need the massive influx of outside help so necessary in the case of the Burmese cyclone. The Red Cross and World Vision are two of the global aid agencies that are co-ordinating help for Sichuan's victims.